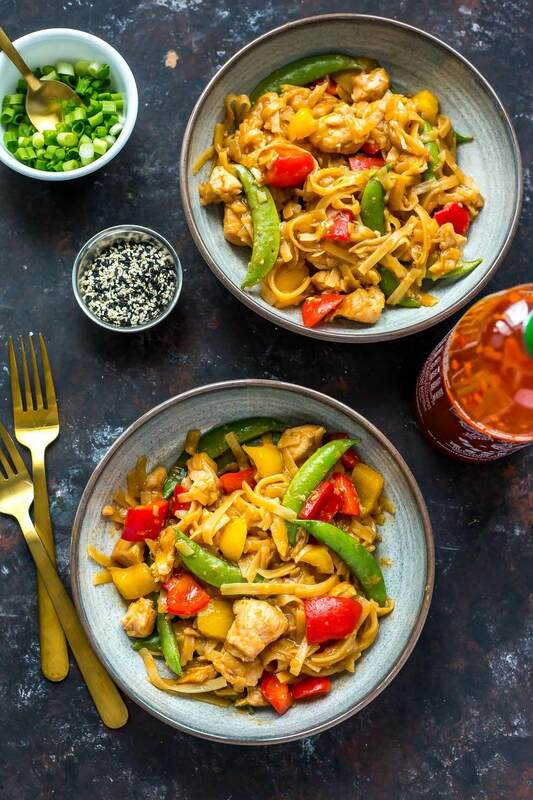 These Instant Pot Honey Sesame Chicken Noodle Bowls are a tasty Asian-inspired meal that will satisfy your cravings for takeout – just dump it all in the pressure cooker and dinner's ready in 20 minutes! Wanna whip up a stir fry but just don't have the time or energy to do all that chopping then stand by the stove stirring everything all together? Sometimes what we hate about cooking is that it just takes too much work, am I right on that? 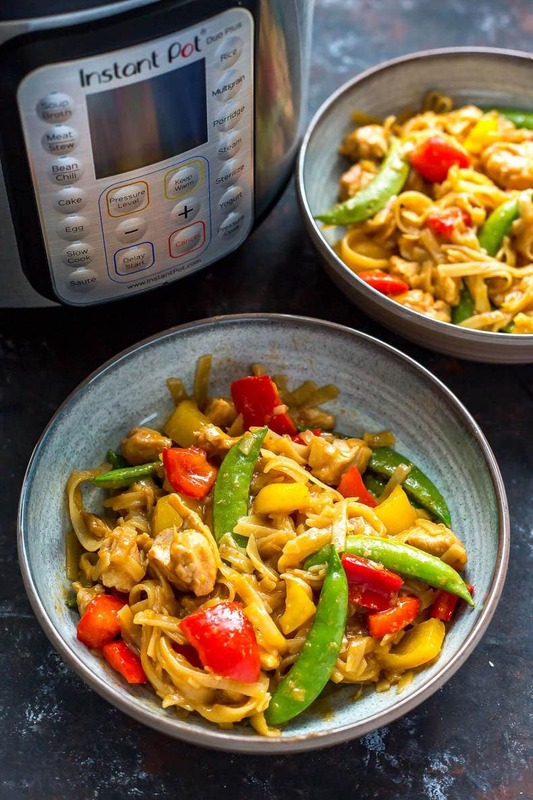 Well, eliminate all of the hassle and the waiting with these Instant Pot Honey Sesame Chicken Noodle Bowls! 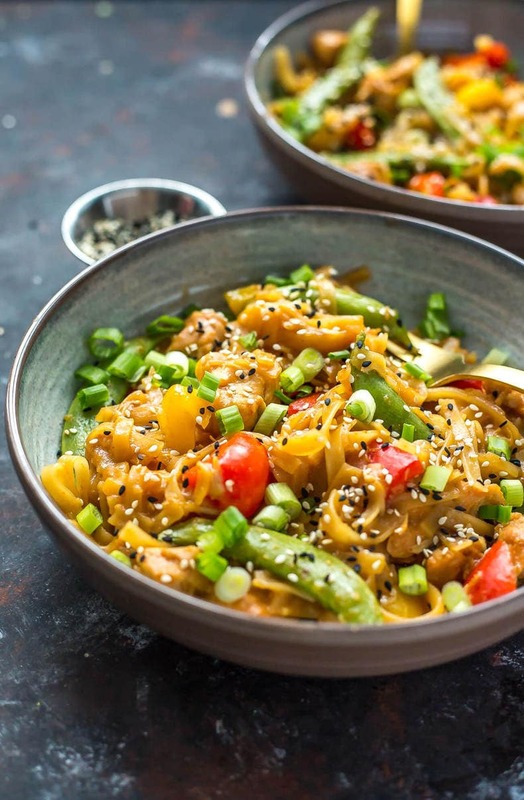 I swear, these sticky, savoury noodles are just what you need after a long day, and the best part is that you can dump it all in your Instant Pot, then set it and forget it…and unlike the slow cooker, all of this is ready in just about 20 minutes so if you're sitting there starving debating on whether or not you should order takeout, let's just say these Sesame Chicken Noodle Bowls will be ready before your delivery guy shows up! Rice noodle bowls have been my jam for a looooooong time. We actually have this amazing place that serves stir fry bowls called Basil Box in Toronto, and I'm obsessed. You pick out your grains (I choose noodles over rice every time! ), then your protein, veggies, sauce and toppings. I'm a big fan of the concept when it comes to home cooking as well. These Instant Pot Honey Sesame Chicken Noodle Bowls are a similar idea, except it all comes together in one pot for minimal clean up. 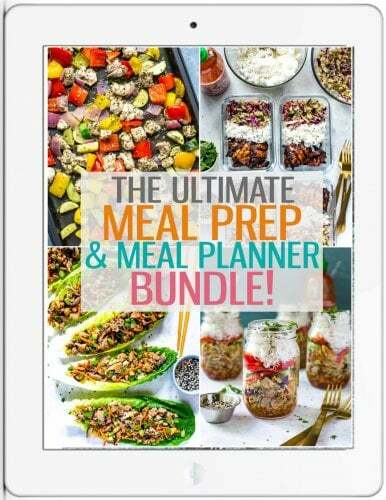 You can even make these your weekly meal prep! Just add in the sauce ingredients, most of which are pantry staples you probably already have on hand at home, then dump in your diced chicken breasts and uncooked rice noodles. Set your Instant Pot to the pressure cooker setting for 3 minutes, et voila! Dinner in under half an hour! Before I got my Instant Pot I kept seeing all these recipes telling me to cook everything for 3 minutes and I was honestly so confused, like how can all of this cook in such a short time? Well, I should warn you that once you dump everything and start the cooking process, it does take a little bit of time to preheat, but it's not too long. Maybe 10 minutes or so? Then everything pressure cooks for whatever time you set it to. You don't need long to cook the rice noodles, but I should tell you that they do get pretty soft. If you're looking to have a firmer noodle, you can soak them in boiling water (I use the kettle and pour the water into a large bowl but you could boil it on the stove) for 1-2 minutes until you get the right balance of firmness/softness. Honestly though, I just prefer to dump it all. 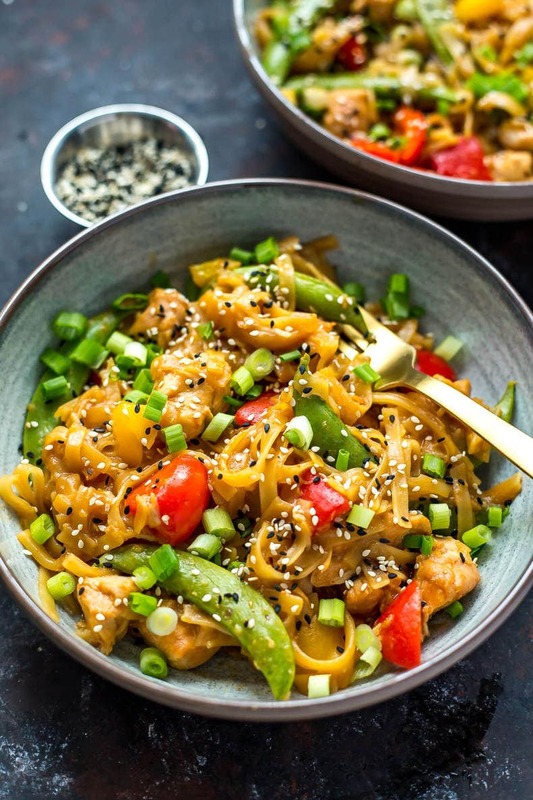 From there, the secret to these Instant Pot Honey Sesame Chicken Noodle Bowls is to use up whatever veggies you have on hand in the fridge – I've almost always got bell peppers and some sort of green veggie so those always go in. Broccoli, carrots or even some greens like spinach would be other great additions. Another important thing to note about this Instant Pot Honey Sesame Chicken Noodles recipe is that you don't cook the veggies in the Instant Pot on the pressure cooker setting, you throw them in afterwards to sort of “steam” them. I find the heat from the noodles and chicken mixture along with 5-10 minutes of wait time is enough to cook the veggies just enough so that they are tender but not so much that they are mushy. 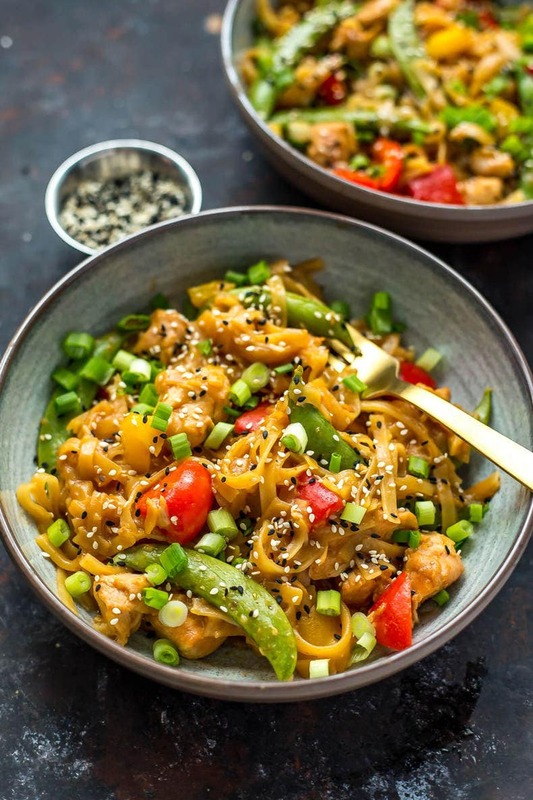 If you don't care about how firm your veggies are in these Instant Pot Honey Sesame Chicken Noodle Bowls then you can certainly throw the veggies in at the same time as the other ingredients and cook it all together, it's really up to you. Now say hello to takeout fake-out at home on a busy weeknight! YUM! 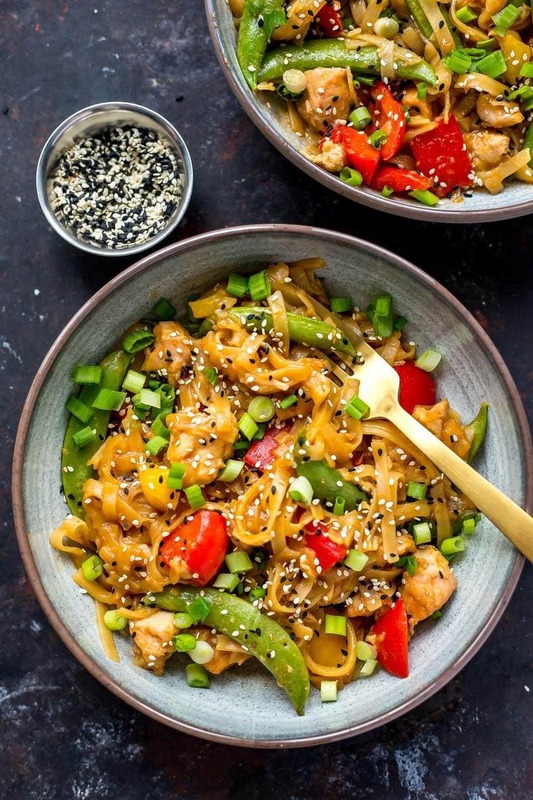 Will you be making these Instant Pot Honey Sesame Chicken Noodle Bowls? 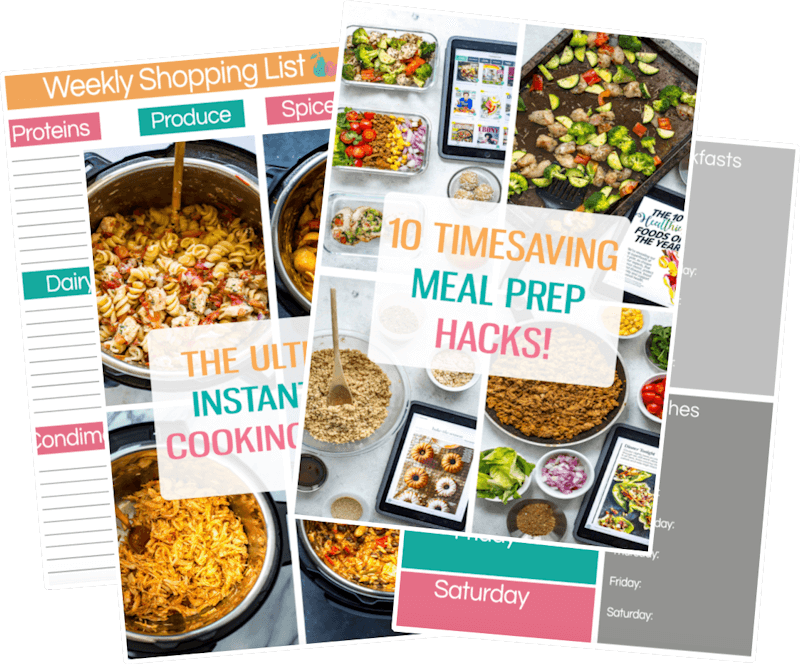 My Instant Pot is seriously changing the game when it comes to meal prep. Who knew your weekly work lunches or last minute dinners could be transformed with so many one pot recipe ideas? I would have got one sooner had I known how much I would love this thing! 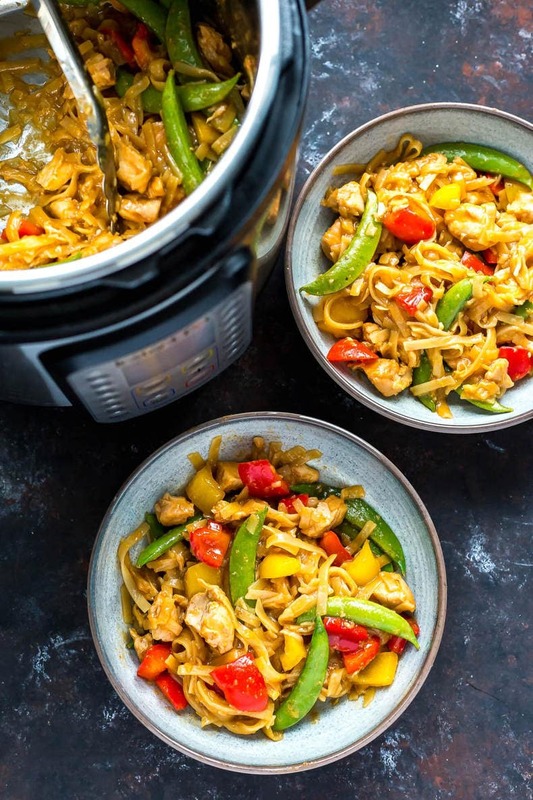 These Instant Pot Honey Sesame Chicken Noodle Bowls are a tasty Asian-inspired meal that will satisfy your cravings for takeout - just dump it all in the pressure cooker and dinner's ready in 20 minutes! Add all ingredients except for snap peas, bell peppers, scallions and sesame seeds to Instant Pot. Leave noodles sitting on top of other ingredients just above the liquid. Set to manual and pressure cook on high for 3 minutes. Instant Pot will take about 10 minutes to pre-heat and then the 3 minutes to cook. When complete, press cancel and do a quick release of the steam, waiting until the pressure gauge drops back down and the lid is safe to open. Stir in snap peas and bell peppers, then place lid back on and let sit for 5 minutes. Serve and top with scallions and sesame seeds. Enjoy! If I substitute pork tenderloin for the chicken how long do I need to cook? Hi Lisa – I’ve never made this with pork tenderloin so I really couldn’t tell you unfortunately! Lisa, did you end up trying it with pork? I’m also wondering how long now. I made the recipe last night and I already want more. Keep posting these instant pot recipes! Yours are great as they’re one pot, dump it all in recipes – perfect for quick meals! Made the burrito bowl and turned out great. Will try this one tomorrow! Can you meal prep these and freeze ahead of time and then throw in frozen? I wish I could answer that Michelle but I haven’t tried that myself! The cooking time would probably be different so I can’t even give you an estimate – sorry about that! Looks delicious! I like my peppers a bit mushy. Are they quite firm just mixing them in at the end? Do you think they would turn out ok if I added them in with the other ingredients and pressure cooked them? Hey Vanessa! If you like them a bit mushy you could definitely add them in at the beginning 🙂 I like mine pretty firm so that’s why I suggested mixing in at the end. Let me know how it turns out! It was delicious! I added broccoli too for some extra veg! I also love my pot & stir fry…..I am wondering do you think if you wanted a bit less firm but not mushy veg, if adding veg at end, then putting time at 0 and start, so it just builds pressure then is done would work?….I`ve done the 0 time before and is crazy…. this looks so yummy. however can you tell me what your serving size is? I see it has a total of 4 servings. but …. would be helpful to know for those of us calorie counting. and make it eaiser than having to split the meal in 4 equal parts. Hey Amy! You would just divide the recipe in four – I’m sorry I can’t offer a serving size per cup. If I had to guesstimate, I would say 1 1/2 to 2 cups is a serving size? If you double it, would you increase the time? Unfortunately I haven’t tried it this way myself…maybe up it by a minute and see what happens? I wouldn’t double the time! I ended up doubling it tonight because I had too much chicken and a bigger pack of noodles. I doubled everything and kept the time the same. It came out perfectly and now we have a second meal! I am wondering what you could substitute he sesame oil with. We have some allergies in our family but love Asian food. We cannot do sesame, soy, or gluten. Do you think that just canola oil or avocado oil would work? I’m so excited to try this! I received an instapot for Christmas and haven’t used it yet, so this will be my first attempt! Am I reading correctly that the chicken is put in raw? Thanks! Hey Jenny! YAY! I got mine as a Black Friday deal and LOVE it! You do put the chicken in raw – the Instant Pot typically takes about 10-15 minutes to come to pressure, then it pressure cooks for 3 minutes, and quick release takes about 2 minutes so you’re really cooking it all for 20 minutes or so. And the chicken is diced into chunks so it cooks fast! Wondering if you could sub broccoli for the snap peas? If so, do you think you should Blanche first. Thanks for the great recipe! This turned out great! My chicken breasts were both very large, so I doubled the noodles, liquid, and spices. That was a good ratio since we tend to go lighter on meat. I would say the end result is 7 servings the way we eat. The spice combination is flavorful and it really does taste like a noodle bowl from a restaurant. Do you mean half of a 454g package of rice noodles or does 454 g = half a package? Quick question – when you say rice noodles – are you referring to lo mein noodles? Hey Sharon! 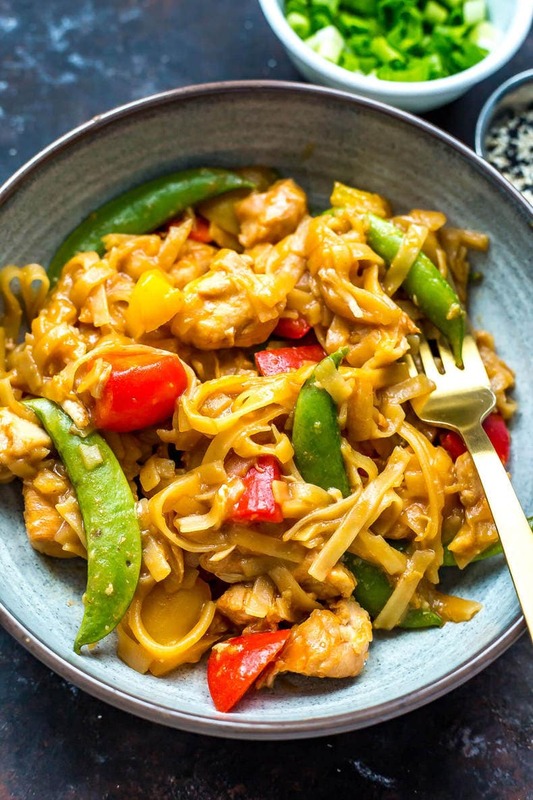 I’m referring to sticky rice noodles that you usually use for stir fries (here’s an example of what I mean: https://www.amazon.com/Thai-Kitchen-Gluten-Free-Stir-Noodles/dp/B003VYDE00/ref=br_lf_m_pnmqggnq62958bg_ttl?_encoding=UTF8&s=grocery&th=1) You could try lo mein but they have a different texture so I’m not sure how they would turn out! Hey there! I just realized I accidentally bought thin rice noodles and they seem so tiny. Do you think they will work? Hey Veronica! They should definitely work but I might cook them separately so they don’t get overcooked. Make sure to leave out half the water when cooking the chicken then mix it all together in the end! Looking forward to trying this recipe! If we soak noodles outside the instant pot, would you recommend decreasing the amount of water added to the pot with the chicken and other ingredients? Thanks! Probably a good idea. I had a little bit larger package of noodles then called for so I added extra water and after 3 mins at pressure plus 2 mins npr plus 6 mins lid on, the noodles were half hard and uncooked. The veggies were totally raw (even spinach!) After the 6 mins with lid on. Trying 2 more mins at pressure hoping I don’t end up with mush for veggies! I think this is going to be my very first instant pot recipe today. I don’t have fresh veggies but I do have a bag of frozen stir fry veggies on hand, do you think I could dump that in you with everything else? Hey Kristin! You could definitely dump it in towards the end! I’m not sure that I would recommend pressure cooking them as they will be softer in texture already when they defrost, but you may need to heat the bowls up a bit after stirring in the frozen veggies because they will probably cool everything down a bit more than fresh veggies would. Let me know how it turns out if you try it! Wow! This was really good. Just the right amount of spicy! Made the house smell so good. I ended up using lo mein noodles cause I wasn’t sure was kind of rice noodles to get but it still turned out great! We substituted peas for broccoli. Could I substitute spaghetti or fettuccine for the pasta? Hey Sarah! I haven’t tested it this way myself so I can’t guarantee how it will turn out, but I assume you could! Just make sure to leave the noodles raised slightly above the liquid. Let me know if you give it a try! So you also leave the noodles above the liquid in the recipe as written, with rice noodles? I didn’t notice that in the instructions anywhere! This looks delish, making it for my in-laws tonight! Hi Taylor! Im excited to try this out! So before you place the ingredients in the instant pot you just used the manual function? I dont have to use any other function? Sometimes I make things harder than they are haha! Hey Brittany! 🙂 Yes you just use the manual function! You and I may have different Instant Pot models…the one I have is the Duo Plus so I select manual, high pressure and then punch in 3 minutes. It should take about 10-15 minutes to build pressure, then pressure cooks the 3 min, then you do your quick release at the top (just flick it open). I know it sounds like it should be more complicated hahaha. Hope you like the recipe, let me know how it turns out! I was wondering if you couldn’t just add the rice noodles in with the fresh veggies at the end to have a firmer noodle? Hey Sharon – I think the noodles would be a little too firm because adding so many cold ingredients in with the hot sauce won’t help the veggies cook a little bit. If you’re worried about the noodles getting mushy then I would advise you cook them separately and cut the water in half that you add to the pot then mix everything together. So glad you liked it Nanci! Sorry to hear you found it a little dry, maybe it turned out differently because of the tofu! I always enjoy trying new recipes and made this for my husband and I tonight. It was sooo delicious! I only used 1tsp of sriracha and it was the perfect amount of heat. My only issue was that my noodles clumped together quite a bit so some weren’t quite cooked through, but that didn’t stop us from gobbling it down! Do you think you could make this in a slow cooker or a pressure cooker ? Your recipe ingredient GINGER doesn’t specify ground ginger or fresh ginger. Since the amount is 1 Tablespoon, I’m thinking it’s fresh ginger. Is that correct? So sorry Vicki, yes it’s fresh minced ginger! I don’t have any sriracha on hand, do you think it would matter if I left it out completely? This was the first recipe I tried with my new Instant pot OMG I love, love, loved it. This one with be a regular at my house. Thank you!!! I’m obsessed with my instant pot! This recipe is so easy! Now you’ve got me hungry! The name of the recipe say HONEY sesame, but I don’t see honey in the list of ingredients. Oversight, or really no honey in it? Cancel that. apparently it is too early in the morning for me to be planning dinner. I looked right past it. gonna try this recipe and the pad thai…. Yay! So happy to hear that Brenden! any advice with those of us without a Instant Pot? Want to invest in one later but for right now I would love to try this recipe but don’t know how to substitute it? Is this 1 Tbs Fresh Ginger? Another great dish Taylor. Thank you. I made this and it was really good except for the fact that the noodles were undercooked and stuck together. Any suggestions for next time or why this may have happened? Hey Patti – sometimes it depends on the way the noodles were placed in the pot or the brand of noodles. Letting them sit an additional 5-10 minutes in the pot with the lid on once you’ve mixed everything together usually does the trick in softening them. Hope that helps!